Families spending the Holy Week in the city can avail of the special summer promotional rates at select Resorts World Manila hotels and enjoy the easy accessibility of St. Therese of the Child Jesus parish church where they can fulfill their religious obligations. With eight hotel brands and nearly 70 dining options, RWM has something for every family’s budget and preference – from international five star brands such as the Hilton Manila, Sheraton Manila Hotel, and the Manila Marriott Hotel, to smart stay options such as the Holiday Inn Express Manila Newport City, Belmont Hotel Manila, and The Savoy Hotel Manila. RWM signature restaurants have seafood selections throughout the Holy Week. In addition to its expansive seafood specialties, Passion Cantonese Restaurant at Maxims Hotel has the Passion Mixed Seafood with Crab Meat Adlai in Tomato Sauce available from April 15-21 to give a fresh take on abstinent dining. Families looking for five-star Easter treats can check out the Hilton Manila’s Easter Carnival which features a sumptuous Easter Sunday Brunch Buffet, magic show and an egg hunt with premium prizes from 3-5 p.m. Tickets to the Hilton Manila Easter Carnival are Php 2,500 ++ inclusive of brunch. Diners at other Hilton Manila restaurants can also get a free Easter Carnival ticket with a minimum Php 5,000++ spend at Kusina, Hua Ting-Brasserie Chinoise, or Madison. 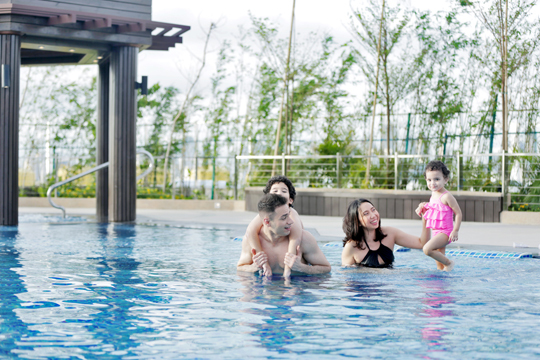 The Hilton Manila also has a special Easter bed and breakfast package for only Php 7,210++ for an overnight stay in a standard guest room with breakfast for two at Kusina. The newly-opened Sheraton Manila Hotel also has a five-star Easter package for April 13-21. With rates starting at Php 12,500 per night per room, Sheraton staycationers can enjoy a breakfast buffet for two at the S Kitchen and Php 3,000 worth of food and beverage credits that can be used at any Sheraton Manila Hotel restaurant during their stay. Holiday Inn Express Manila Newport City (HIEx Manila), Belmont Hotel Manila, and Savoy Hotel Manila have special package rates for enjoyable stays at excellent value. The Belmont Hotel Manila’s Hop and Hunt in Candyland Easter Lunch Buffet has special treats for both children and adults. For only Php 600 nett, kids aged 4 to 12 years old and below have access to a delightful kiddie buffet, egg and face painting sessions, a magic show, an Easter egg hunt and games, and a loot bag. Adults can also enjoy a special buffet spread and will receive a raffle ticket for only Php 800 nett per person. For a sumptuous family feast that won’t break the bank, Savoy Hotel Manila’s Hip Hoppin’ Easter Brunch Buffet at the Savoy Café lets diners have their fill of festive treats from around the world for only Php 1,400 nett per person. 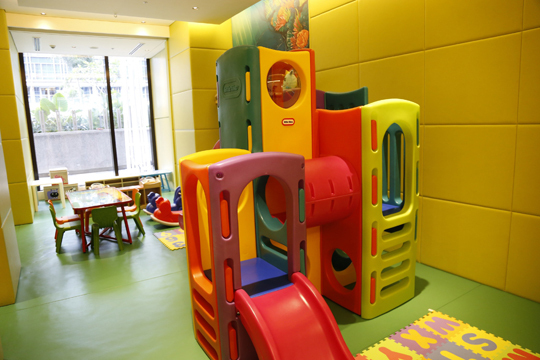 The brunch comes with a free pass to the hotel’s Easter Kiddie Corner. 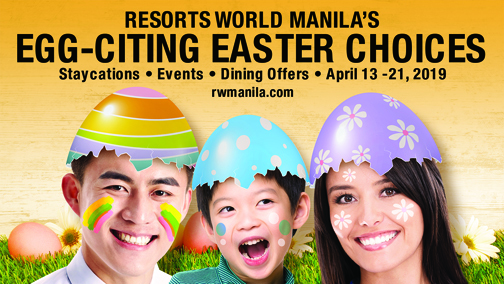 Guests who are checked into any RWM-based hotel from April 20-21 can get a free pass to the RWM Easter Builders’ Playland which they may claim from their hotel’s front desk. Receipts from dining outlets from Belmont Hotel Manila, The Savoy Hotel Manila, and HIEx Manila that meet the date and purchase amount requirements are also valid for redemption at the Easter Builders’ Playland. Families with kids aged four to 12 may join the Easter Builders’ Playland at The Plaza in Newport Mall from 10AM-6PM. Entrance is free for guests with a P2,000 minimum single-receipt purchase from any Newport Mall shop or restaurant. Receipts from any RWM signature restaurant will also be honored. Only receipts from transactions dated April 13-21, 2019 will be honored, and each receipt admits one child and one adult.